Tabbouleh is a salad that originated in the mountains of Lebanon and Syria and was made fun of originally because of its lack of meat, but eventually was kept in the middle eastern diet because of its health benefits. 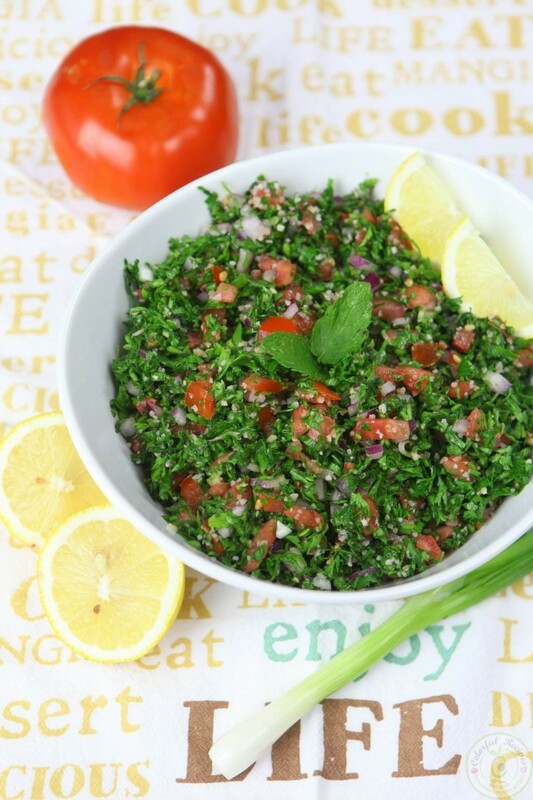 Today Tabbouleh is a staple of Lebanese cuisine and is served prior to every feast. Pre-wash the parsley the night before, discard most of the stems, lay flatly on towel or paper towels in small bunches, turning once, to fully dry. Finely and gently chop the dry parsley using a sharp knife and add to a large bowl. Add sliced mint leaves & chopped tomatoes. Add bulgur to the bowl. Add the lemon juice, olive oil & salt then mix all the ingredients thoroughly. Taste check and adjust the lemon, salt and pepper if needed. In a bowl, cover cracked wheat with warm water and let stand about 15 minutes. Drain thoroughly.